Plans composed of 7 Levels (more accurately 11 Levels) form Layers of various Lives. These layers sometimes overlay each other to bridge the gap between individuals and family, sometimes are divided to withdraw into space of oneself. 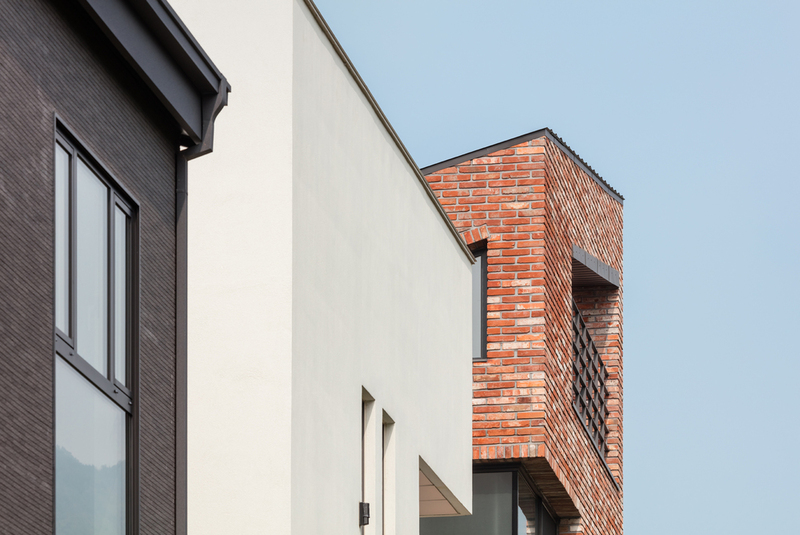 In order to accentuate each character, exterior uniting layers with rough texture and simple shape is compared to interior layers. 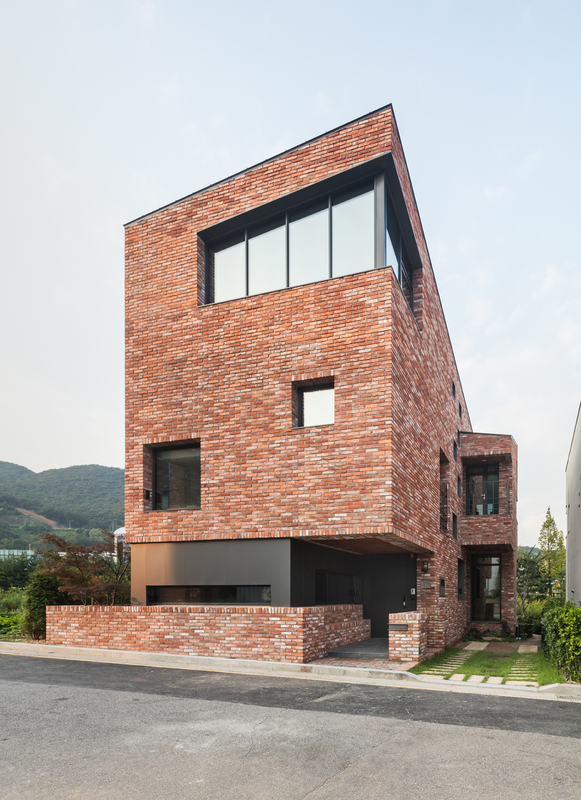 With opposing preference, exterior looks comfortable brick house in relaxing environment and interior made up of harmonious spaces embracing diverse tastes of family are mixed into L house. 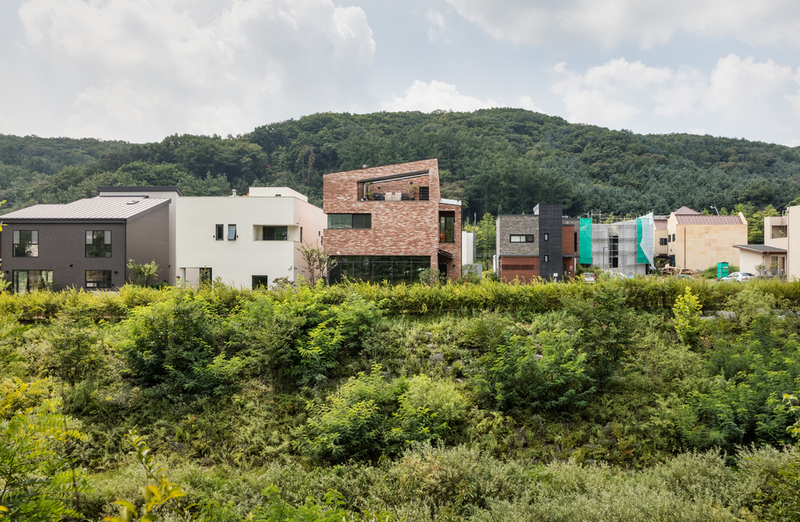 Detached housing area in Pangyo, new town near the Seoul, is allocated into regular rectangular sites. 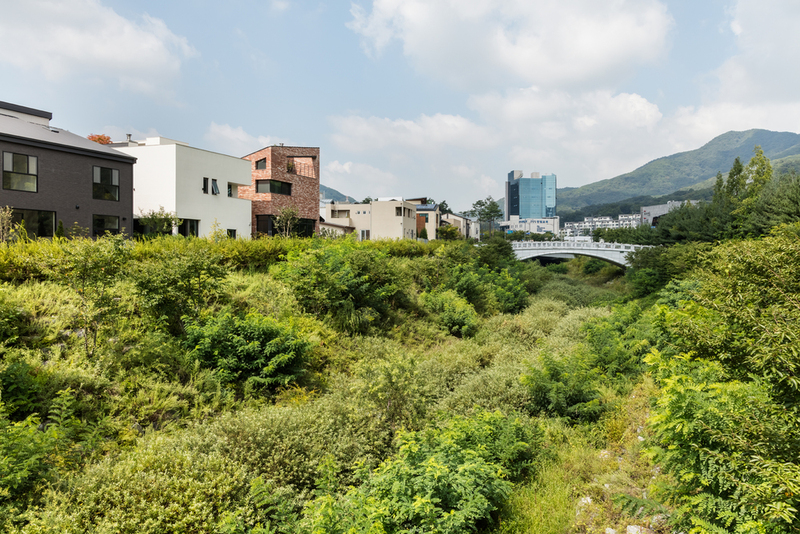 Most efficient site planning in these kinds of plot is one side mass arrangement with an open space another side. However, We plan two masses misaligned to make void spaces between solids. 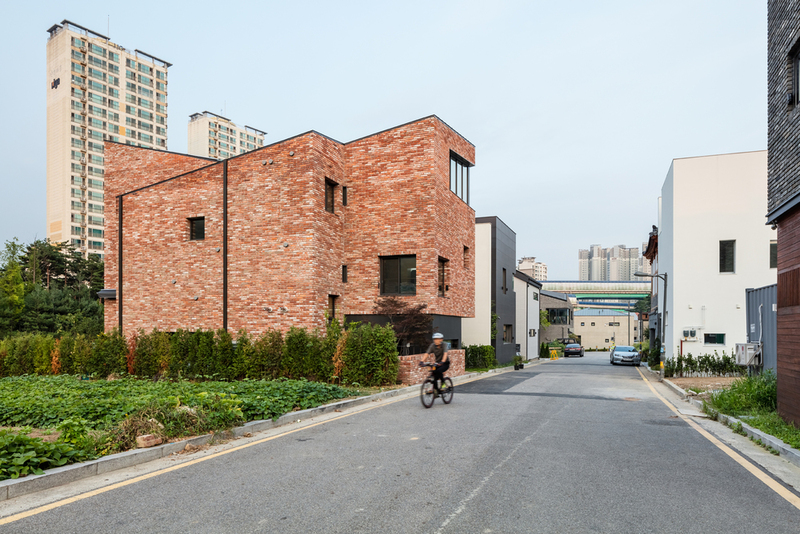 Although smaller than one side open space in physical size, these void spaces between rough brick solids interact with various interior spaces to expand psychological experience. The high stair hall is the first space someone meet whenever enter the L house. This stair hall play more important role of communication in the situation that spaces with various property have to be piled up in limited area than those of in common. The stair hall mediate each layer and Life like a puppy moving about most energetically in this house. Along the stair hall, child rooms, master room, attic and rooftop are linked by skip floor. To avoid closed stair hall cutting of spaces, architect make multiple windows toward east void space, so that improve lighting and secure privacy, and stand free-standing wall with same design vocabulary inside the stair hall, therefore spaces would exchange light and sight. A Skylight at high ceiling of the stair hall symbolize the center of the house. Atmosphere rich with light, air, and sight make stair hall semi-outside space. 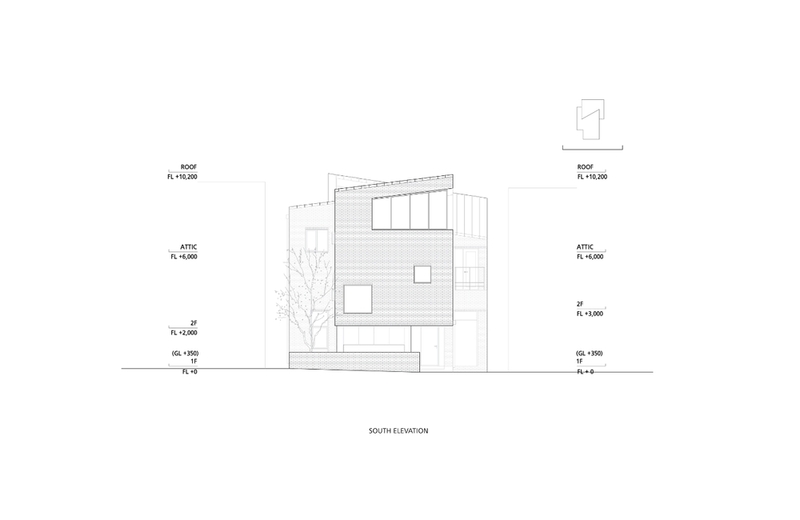 The Living room on the ground floor have wide glass skin at north facade to embrace local stream and mountain. "We come home much earlier to see this scenery these days. "said clients whose opinion that they prefer north scenery to south sunlight. Opposing to lively living room, the library on the semi-basement is a space of silence and moderation. 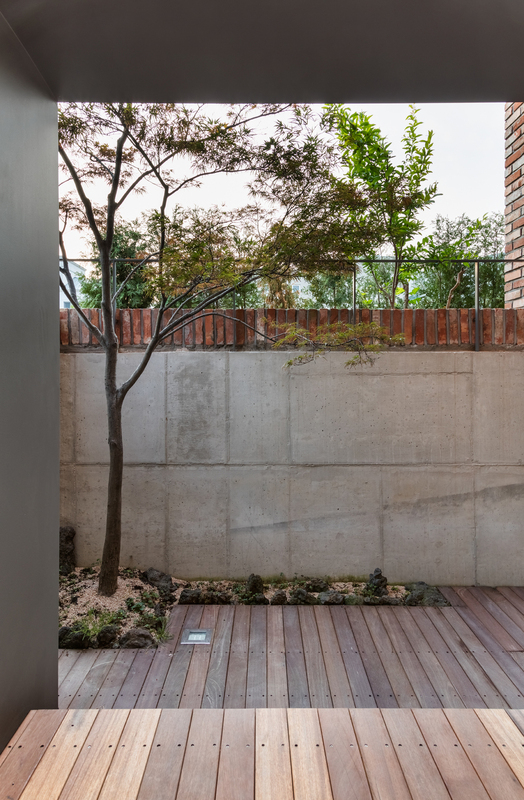 The library surrounded by Deep wood flooring and exposed concrete wall connect to the sunken garden with toenmaru, traditional Korean intermediate space, in which people feel good to take a cup of tea. Difference of Floor-level in Skip floor continue to child rooms to divide rooms into relaxing and working spaces. Two masses with different sloped roof meet across each other above the son's room, provide unique sense of space. The master aster bedroom is compactly designed according to practical usage. Over half of area is a walk in closet tolerating abundant store. 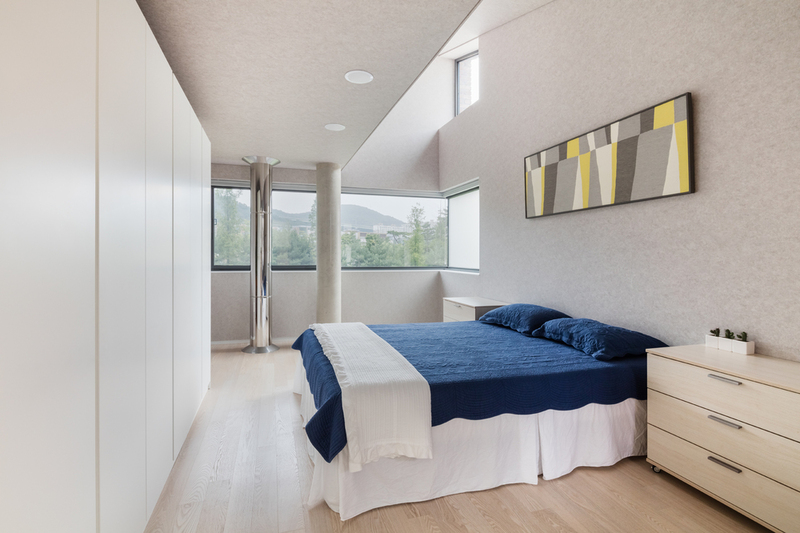 Instead of large floor area, the master bedroom have a high ceiling and a corner window not to be stuffy. 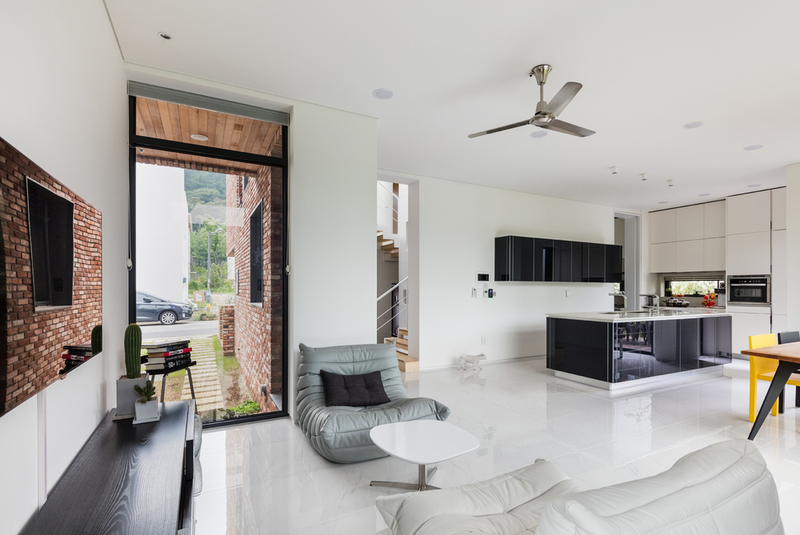 At the top of the front and rear masses, there are rooftop where family could enjoy north natural landscape and attic where they could bask in the south sun light. 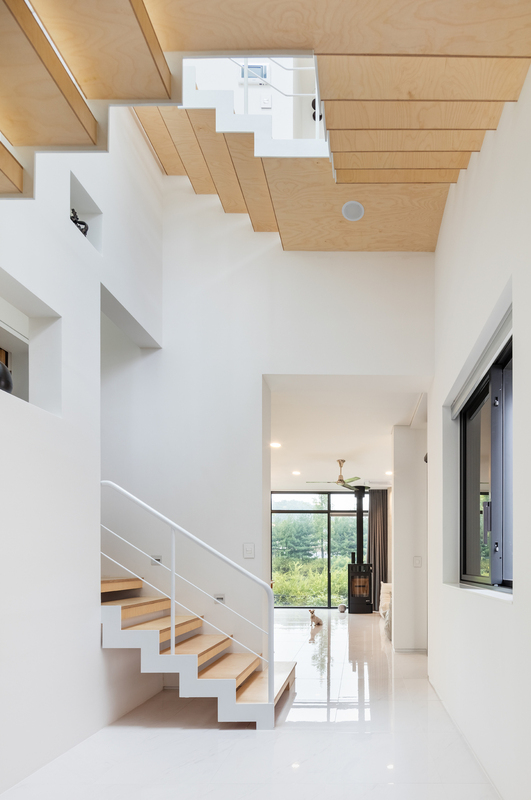 In order to increase availability of these spaces, slopes of the roof get higher outward from the central stair hall, consequentially shape reverse-pitched roof. 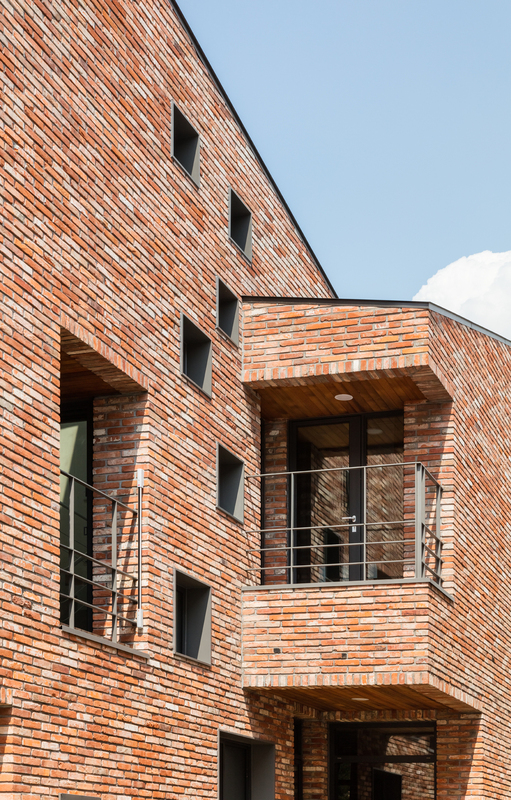 Reversed slope of the roof prevent contamination of the exterior by blocking rainwater flowing out into masses, collect and flow it into void space between solids.